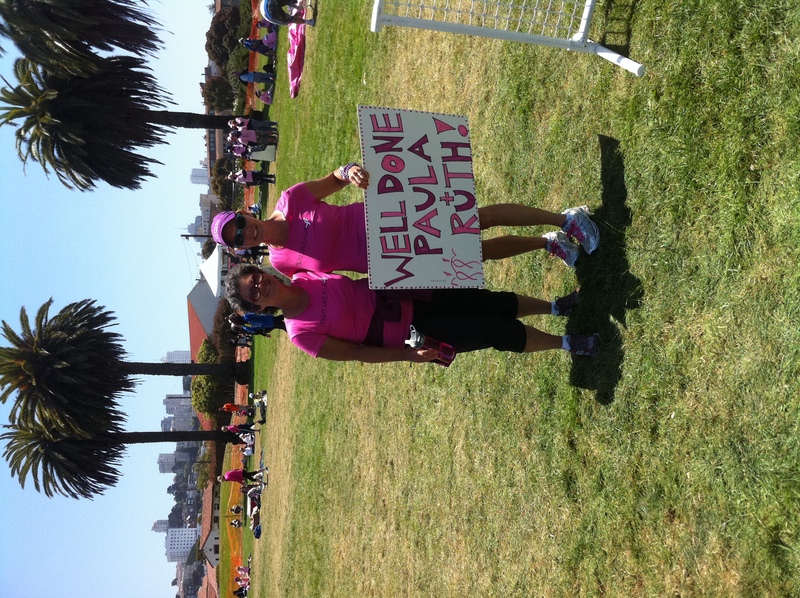 The Avon Breast Cancer Walk was held in San Francisco on July 9th and 10th. Ruth Patterson and Paula Rini, both members at FIT, attended. We couldn’t have asked for a more beautiful walk through San Francisco: starting along the waterfront, winding through downtown, North Beach and Pacific Heights, and then crossing the Golden Gate Bridge. Our lunch stop was Fort Baker at the base of the bridge; although chilly and windy, the views back to the city were spectacular. Finishing lunch, the course took us through Sausalito and along Richardson Bay to Mill Valley and Corte Madera. All along the way we were cheered on by the sweep vans, bicycle police in pink polo shirts (with boom boxes strapped on the bikes), and volunteers on motorcycles sporting pink wigs or tutus. It was a joyful and celebratory atmosphere. The walkers felt so appreciated, especially when residents along the route came out to offer us fresh strawberries or small chocolates to boost our energy. Through this amazing event, more than 4.2 million dollars was raised for the Avon Foundation. These donations will go toward medical treatments for women and men diagnosed with breast cancer, as well as research to help find a cure. A wonderful gift for my mom – 90 years old and doesn’t want things – doing this walk in my mom’s honor really meant a lot more to her than any physical gift. She talks about it all the time! This entry was posted in Events, Healthy Lifestyle, Uncategorized and tagged Avon breast cancer walk, breast cancer walk, San Francisco breast cancer walk.